The Associated Press earned a virtual tongue-lashing Tuesday night after declaring that the ongoing partial government shutdown — spurred by President Donald Trump’s demand for border wall money — was equally the fault of the President and congressional Democrats. “It takes two to tango,” read a tweet from the AP’s Politics account late Tuesday. But on this shutdown, Trump is dancing alone. In reality, the partial government shutdown has been deemed “the Trump shutdown” for a reason. Trump said multiple times before initiating it that he would be proud to shut down the government, and that he would take the blame for doing so. And so he did. Despite Congress being under unified Republican control for two years, Trump never got a deal for his wall money. 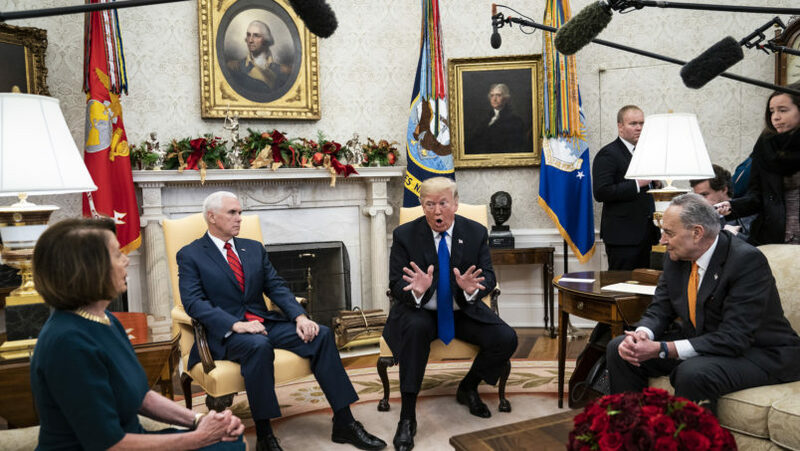 And despite both chambers of that Republican-controlled Congress being prepared to pass a government funding package without wall money last month, Trump demanded billions in wall funds anyway, after saying clearly that he knew the consequences of doing so. So when the government shut down as a result of Trump’s demand, there was only one person to blame: the one man who said he would proudly and knowingly shut down the government. On Wednesday Dec. 19, shortly before Trump began the shutdown, the Senate voted to keep the government open by passing a temporary funding package, effective through Feb. 8. Senate Republican leadership openly said they expected the President to sign it and keep the government open. “He will sign a clean [continuing resolution],” Senate Majority Whip John Cornyn (R-TX) predicted, incorrectly. Senate Majority Leader Mitch McConnell (R-KY), who introduced the funding package in the first place, was similarly resigned to what seemed like an obvious reality: The President would sign a funding bill without wall money. “I’m sorry that my Democratic colleagues couldn’t put the partisanship aside,” he said. After passing the Senate, the package was set to receive approval in the House of Representatives, and then arrive on the President’s desk. Here’s where Trump stepped in and kept his promise to shut down the government, by announcing that he would not be signing anything without wall money. Trump broke the news to then-House Speaker Paul Ryan (R-WI) in an Oval Office meeting on the morning of Dec. 20. Speaking to reporters after meeting with the President, Ryan seemed taken by surprise. “The President informed us that he will not sign the bill that came from the Senate last evening,” the Speaker said, standing in front of the White House. Without saying so, Ryan expressed an obvious truth: Without Trump’s signature, the government would be shutting down. And without Trump’s signature, it did.